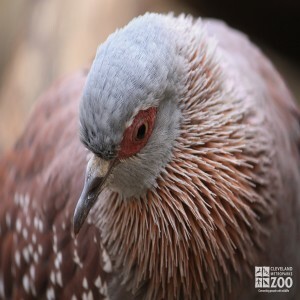 The Speckled Pigeon's range is Ethiopia to South Africa. Speckled Pigeons inhabit open country and cultivated regions, avoiding forests. The speckled pigeon is a ground feeder. It feeds largely on seeds, including cultivated grains. They are fond of groundnuts when these are available on or near the surface after harvesting. They are usually found in pairs, singly, or small parties, but large numbers may congregate at good feeding grounds. They sometimes form large and cohesive flocks when not breeding. This flocking habit seems to be more common in South Africa than in the northern part of the range. Flight is direct and fast, with strong wing beats. They walk and run nimbly on the ground. There are several different vocalizations. Speckled Pigeons nest in cavities at the base of the leaves of Borassus palms, in holes in trees, and in holes or on sheltered ledges of cliffs or buildings. In parts of Uganda they regularly nest in mine shafts. The young fledge at from 20 to 25 days, depending on location.